Corporate Communication Joep Cornelissen Chapter 8-14 Summary of chapter 8-14 of the book of Joep Cornelissen. All information is taken from that book. Some references in the summaries can be found in the book. It is the 4th edition of Corporate Communication. Samenvatting H1 t/m H12 Cornelissen Summary of H1 / m H12 of the following book: Cornelissen, J. (2014). Corporate Communication. A Guide to Theory and Practice (4th Ed.). London: Sage. Corporate Communication chapter 2-7 Joep Cornelissen A summary of the chapters 2-7 from Corporate Communication. Helped me a lot with studying for my exams. Corporate Communication: A Guide to Theory and Practice. Corporate Communication B Chapter 8 - 14 summary Complete summary of chapter 8 - 14 of the book Corporate Communication by Joep Cornelissen. Corporate Communication CH 1-7 Summary of Chapter 1-7 of the book Corporate Communication by Joep Cornelissen. Helped me pass my block 1 exam. E-book Corporate Communication, J. Cornelissen E-book Corporate communication, J. Cornelissen. Written specifically for students interested in knowing more about the organizational and management context of communications, and to get more hands-on learning, practical experience and skills to help them get off to a flying start in their career, this book is a guide to corporate communication that will help students and practitioners navigate the area, understand the main theories and put these into practice through examples and case studies. Academically grounded, it covers the key concepts, principles and models within corporate communication by bringing together academic knowledge and insights from the subject areas of management and communication. 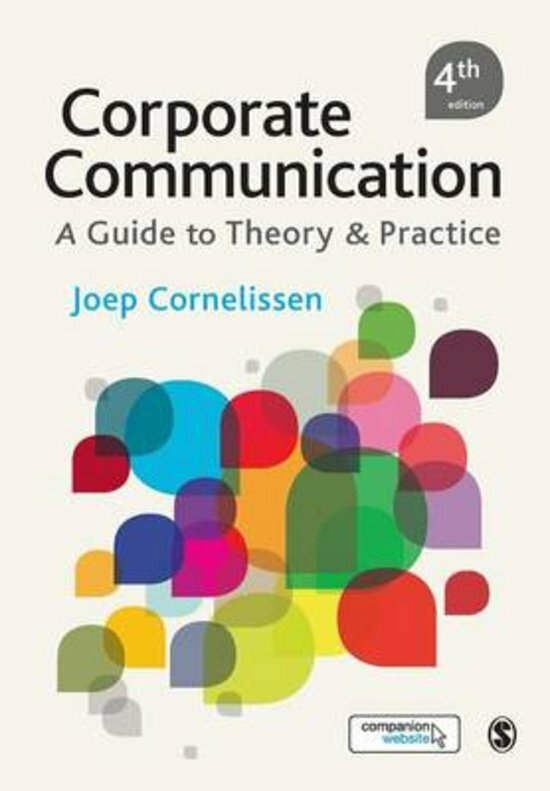 On this page you find summaries, notes, study guides and many more for the study book Corporate Communication, written by Joep P. Cornelissen & Joep Cornelissen. The summaries are written by students themselves, which gives you the best possible insight into what is important to study about this book. Subjects like corporate communication, joep cornelissen, Corporate Communication, communication, Communication, cornelissen, corporate communicatie & FT will be dealt with.